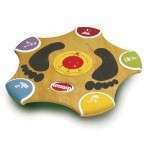 The Wobble Deck is an electronic balance game designed mainly for children. Kids can select one of the three multi-level games (Memory Match, Speed Play and Freestyle) and improve their balance, reflexes, memory and coordination. 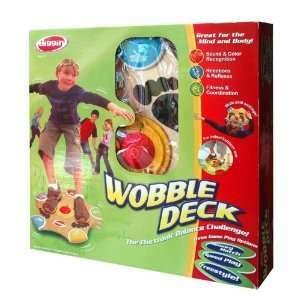 And I must say the Wobble Deck balance board is very sturdy so adults can play as well. Challenge your friend to a wobble duel! You can use the Wobble Deck as a fitness tool to improve your balance and muscles – but when the fun really begins is when it`s played as a competitive game. Each person takes a turn to see how long they are able to follow the board`s instructions without a mistake. The Wobble Deck Balance Board is a great tool for children, adults and families to have a lot of fun and enjoy their time together – as well as improve reflexes, muscles and balance.